Another packet of goody I bought on my first trip to Tokyomart! While I was at the store, I had quite a difficult time deciding between this packet of lychee candy & another packet of candy from the same company. But eventually I decided on this, because of the pretty shiny & bright packaging, and the fact that I love lychees! 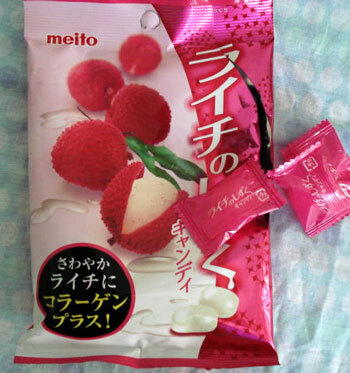 As I opened one of the little individual packets of candy, the lovely sweet scent of lychees soon filled my nostrils & I instantly popped the little white candy into my mouth, I immediately tasted the strong pleasant lychee flavour, savoring the sweet lychee taste in my mouth. I have to admit, I had a hard time putting this packet away, so I popped some more into my mouth, one after another! I finished about half the packet in 2 hours! I'll definitely be buying more of this on my next trip to Tokyomart! I paid my first visit to Tokyomart in Northbridge 2 weeks ago, I've planned this trip for months ever since I learned about this incredible Japanese grocery, only one of the very few Japanese groceries in existence in Australia. Since a young age, I've always been passionate with almost everything Japanese! From Japanese culture, to their food, their fashion, and their pop culture But I guess having some relatives who are half Japanese & some who are currently living in Japan, impacted me greatly with Japanese things since childhood. Anyway, as I was on my way to Tokyomart, I couldn't contain my excitement as it was my first trip to a authentic Japanese grocery...on my mind, one of my big intentions of visiting this place was my eagerness to try all those interesting & unusual Japanese kit kats! I'm a huge fan of kit kats and have always wanted to try those wacky ones from Japan! However, as I searched around the store, I was quite disappointed to find no kit kats in the store...not even ONE little packet of kit kat! I was aware beforehand that it is terribly hard to find Japanese kit kats outside Japan...however I had assumed, well, more like 'hoped' that they would still be available in a authentic Japanese grocery like Tokyomart...I guess I was wrong. However not all was lost, I still wandered around the store for about an hour, relishing my experience in a Japanese store, surrounded by authentic Japanese food & groceries, of course, throwing packets of Japanese confectionery into my basket along the way! 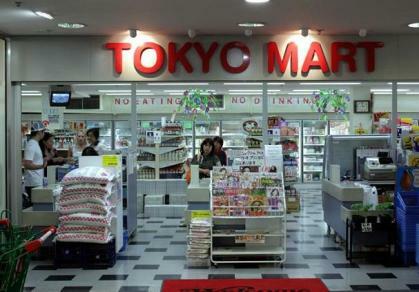 Tokyomart is a haven for authentic Japanese grocery & cookware, the workers at the counters & much of its customers are Japanese. Often you will see elders carrying their grocery baskets as they chat friendly with each other in Japanese in the store. Once you step inside the store, it just feels like you've transported yourself to Japan, the experience is amazing! There's only 2 complaints I have about Tokyomart...1 is the fact that they don't sell Japanese kit kats! And secondly, it's situated in the North Sydney area, very far away from where I live & the travel fare is quite costly...it cost me about $13 for the total travel fare itself (including the train & bus tickets), and it took nearly 2 hours just to get to Northbridge! And then it took me another half an hour just to find Northbridge plaza where Tokyomart is located in. This is probably just a personal problem, but the trip to Tokyomart for me personally, is quite troublesome since there's so many routes I have to take in order to get there from the suburb I live...not to mention costly! But I'm still very willing to make the trip again...just not on a frequent basis...I wish they'd open another Tokyomart that's in someplace closer, like the CBD or near chinatown somewhere as it's much easier for me to get to those places. I heard they have a Tokyomart in Chatswood too, but it's quite far away as well.